At last.. integrated Arriraw recording in the Alexa camera. 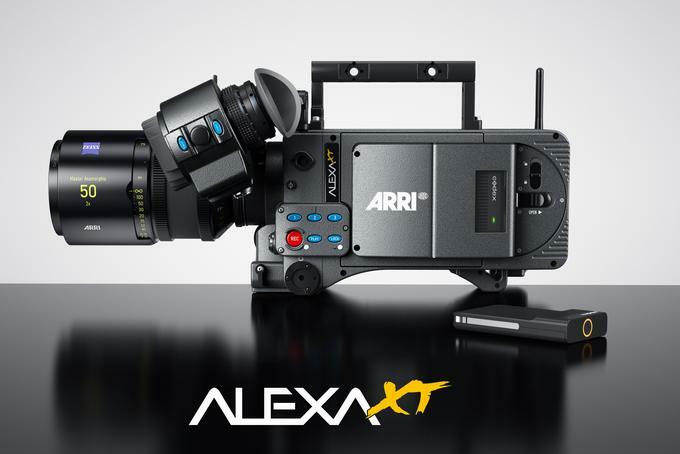 Codex has worked closely with ARRI during the development and launch of the Alexa family of cameras. The Codex Onboard Recorder was the first recorder to be certified to record ARRIRAW from the Alexa back at the beginning of 2011 and has since been used on hundreds of feature films and commercials worldwide. ARRIRAW has become the output of choice for feature films, including The Avengers and Skyfall and Codex recorders have become the recording standard. The ARRI Alexa features a 35MM CMOS bayer sensor. The sensor data is output over T-link to the Codex Onboard Recorder, where it is recorded on a Codex Datapack or Capture Drive. ARRIRAW is 12 bit logarithmic raw Bayer data. The resolution for 16:9 is 2880 x 1620 and for 4:3 it is 2880 x 2160. ARRIRAW can be output and recorded at up to 60FPS for 16:9 and up to 48FPS for 4:3 to an external recorder. Fast forward to 2013. ARRI and Codex announce the new Alexa XR (extended recording) Module. Building on the success of the Alexa/Codex combination, Codex and ARRI have developed a module that incorporates Codex recording technology directly into the camera. This alleviates the need for cables between the recorder and camera, makes the camera package smaller, and further simplifies ARRIRAW recording. It also enables higher speed ARRIRAW - up to 120FPS for 16:9 and up to 96FPS for 4:3. These developments are bound to intrigue cinematographers and further cement the Alexa/Codex/ARRIRAW workflow as the standard for digital production. The XR Module provides several recording options in a single package. ARRIRAW at up to 120FPS (16:9) can be recorded onto a high performance Codex Capture Drive. In addition, Apple ProRes or Avid DNxHD can be recorded to a Capture Drive, making longer recording times possible (up to 2.1 hours of ProRes 4444), or with an SxS adapter, to an SxS PRO card. Anyone who's spent some time working with the Alexa and Codex on-board recorders can attest to how desperately needed internal Arriraw recording is. Just about everything about the Codex system is thoughtfully designed and executed - the stability of the recording, robust equipment, and control of metadata and deliverables with the Virtual File System. The big problem is the deck is quite large, is an expensive rental, and there are inevitably BNC cables running between it and the camera. Not to mention getting the Codex working happily with the Alexa means matching many menu items on the two devices, several of which are labeled differently and mismatch can result in irreversible recording errors. It's a good system but it's one that's by no means bullet proof. In any video recording system, whenever a cable is introduced between the camera and the recorder the possibility for error is exponentially increased. A native, integrated recording system controlled solely by the menus within the camera greatly reduces all these problems and makes for a faster and more intuitive user experience. Needless to say I'm thrilled to see this functionality coming to the Alexa and think Codex was the obvious partner given their expertise with Arriraw. Why reinvent the wheel if you don't have to? All new Alexa's (except the entry level 16x9 camera) will ship with the XR module and will be called Alexa XT (Extended Technology). Behind-the-lens ND is actually another godsend and something I've been preparing a separate post on. Conventional, Front-of-the-lens filtration and use of heavy ND, sometimes 7 or more stops, is the most destructive factor in digital imaging and something that is easily remedied by putting the glass behind the lens. As Digital Imaging Technicians, painting out color temperature offests in neutral density filters is one of our most common tasks and another factor that it seems technology will alleviate us of. Much more on this later..
Conveniently the integration of Arriraw into the camera solves another big problem for us, and means another blog entry I don't have to finish writing, which is the problematic workflow for on-set color correction with Codex recording. Because all the current external Codex decks - M, S, and Arriraw - require the Alexa's REC video outputs, getting a Log-encoded video signal to be used for on-set color correction presents a host of challenges. Ordinarily, the DIT would use one of the camera's REC Output's for a clean, 10 bit, 422, Log-encoded video signal to be used with color correction software such as LinkColor or LiveGrade. This allows the operator to create data directly on the set in the form of ASC-CDL or 3DLUT's to be used for color corrected production dailies. When the camera's REC Out's are being used to feed the deck and the deck in-turn doesn't output a video signal that's useful to us, the user has to get creative to get their workflow working. Alexa REC Out's to Codex Input's. Even with a Single-Link 3G recording, the camera's other Rec Out still ouputs a data stream that isn't useful for video monitoring. So in order to get Log-encoded video for the DIT's use, the camera's MON Output needs to be put into Log C. Addtionally, the MON Out can only output a Legal levels video signal unlike the REC Out which can be set to Legal or Extended levels. There are workflows that require an Extended level video signal so if we can't get one out of the camera, this can present more problems to be solved. Using a 3-wire BNC video harness, one cable is used to monitor the Codex' output which unfortnately isn't useful for anything other than verifying the recording. The second cable takes the Log-encoded MON Out from the camera to the DIT where it's color corrected and then using the third cable in the harness, is fed back to the camera to be used by the assistant's on-board monitors. The main problem with this is it's often impractical to send a color corrected return back to the camera to be used by the AC and operator. This can be for any number of reasons - long cables runs, wireless video for a vehicle shot, process trailers, etc. In practice, it really isn't fair to them to have to focus using Log C video as this flat, washed out image makes their job even more difficult. The operators tend to hate it as well. Codex XR solves these problems. A separate video channel for users at the camera, an in-camera recording, and a single video link to the DIT is always ideal. Or better yet - a single wireless link. Less is more. Keep the recording and monitoring as simple and discrete as possible and everyone in the camera department - DP, operator, assistants, and engineering - can do their best work.